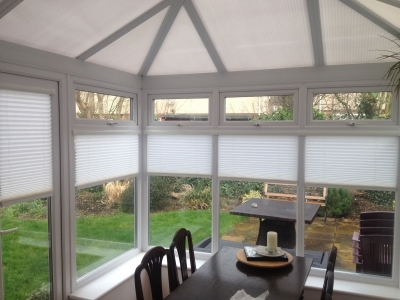 Perfect Fit blinds are available as a roller, Venetian or pleated blind. They are designed for UPVC windows and doors and used extensively in conservatories. The blinds fit directly onto the double glazed window without drilling or screwing into the widow frame. This unique blind system enables the blinds to move with the windows or doors when opening and closing, the blind fits into a frame which is attached to the window with brackets which slide between the glass and the rubber glazing bead. The Perfect fit frame fits flush up against the window so there are no gaps down the sides of the blind. Roller Blinds, Available in a spectrum of colours and shades, our made to measure roller blinds combine style and practicality while covering a full range of functions.